The author, Nikki LeClair is one of my favorite authors on social media. She is always positive, encouraging and delightful. I’m a fan of her cozy mysteries- they are as charming and entertaining as she herself is. Author LeClair‘s latest book is different from her first series. 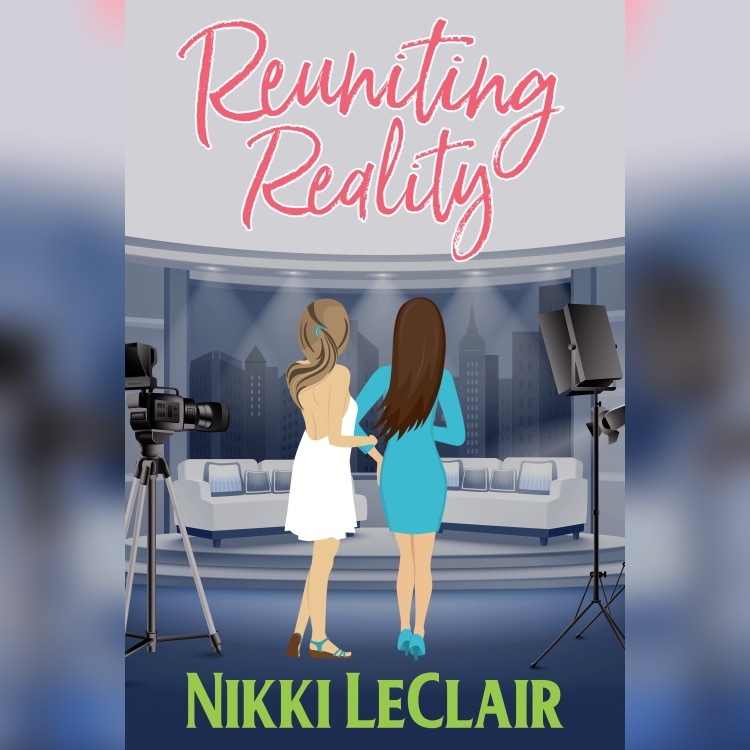 Reuniting Reality is more of a contemporary romance. Now…on to the book! Readers, in case you’ve ever considered being on a reality tv show, because you thought it might be exciting, or a lot of fun- heed the story of our poor heroine, Julie. She’s created a clever idea- the filming of a reality show called “Daughters of Famous Mothers.” She’s combined a variety of daughters, snarky, desperate, looking-for-love-type women and put them all in a fabulous winter resort for a week’s filming of the show. I had fun reading about the production of this type of show, the hot mic moments, as well as the food, fashions and entertainment. The story provides plenty of romance and relationships, tears and humor, sparks and sass . If this sounds like a blast for you- then you will enjoy this book. Jena says: This is one of my favorite scenes. It’s a hoot! The soak is set for forty five minutes. It’s in a beautiful small room with wooden walls and floors, pod lights set low and tea lights lit throughout. There’s a calming woodsy scent throughout the room, which reminds me of a sauna. The tub is Elizabethan style but wooden, with a shiny finish. The beer has already filled the tub, and there’s an brownish foam sitting above with floating multi colored petals. It’s set at just above a lukewarm temperature so I’m able to stay in it for the full thirty to forty five minutes. There are coals in the back of the room which set off a nice steam, like a sauna. I toss my clothes and belongings in the small change room outside the door and then hurry across the room to slip into the tub. Yet, when I put both feet into the soak, I shiver. It’s cool, borderline cold. I hear something shuffle outside the door of the soak room. Nobody replies so I hop out. Covering my now goose-bumped chest, I scurry across the room to the change room, where I pry the door open and look out. The small white room is empty. I reach over for the complimentary robe that had hung on the wall but the hook is empty. I grab at the bench where I threw my clothes but they aren’t there. I enter the change room, and look under the tiny bench to notice that my shoes are gone as well. I’m naked, in a strange room. Who the hell would take my stuff—Diana. I realize I have no choice but to pop the door open and poke my head out so I grab the knob and turn it. Except it stops abruptly. I try again and nothing. Interesting concept so could be a fun read! Yes and wouldn’t it be fun to be in a reality show? I’m a book lover and a tv lover so this story is a god one for me!